From Rich Hill at the junction of U.S. Highway 71 and County Highway B, go east 7 miles to County Highway N, turn right (south) onto Hwy N and 2 miles into Papinville. The cemetery is at the north end of town, north of the last gravel road. The Cemetery was in the original plat of Papinville, April 15, 1847. It is located on the norlth edge of town on the corner of Green and Center Streets. The oldest graves are located on the west side of the gate. The oldest marked grave is Nathanial Eddy, infant son of F.A. Eddy, who died in 1852. There are older unmarked graves surrounded by small fencing. 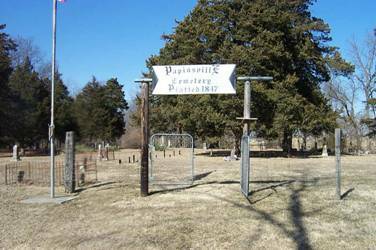 The cemetery is currently maintained by the Papinville Cemetery association who host a fundraiser dinner every fall during the annual Papinville Picnic.